I am yours and deem to save me Artemon. Fitting for his cut off head. The Hieromartyr Artemon was born of Christian parents in Laodicea of Syria in the first half of the third century. From his youth, he dedicated himself to the service of the Church. He served the Church as a a Reader for sixteen years. For his zeal in Church services, Bishop Sisinius ordained him deacon. Artemon also fulfilled this service with fervor and diligence for twenty-eight years, then he was ordained to the priesthood. In this position, Artemon served the Church of God for thirty-three years, preaching Christianity among pagans. 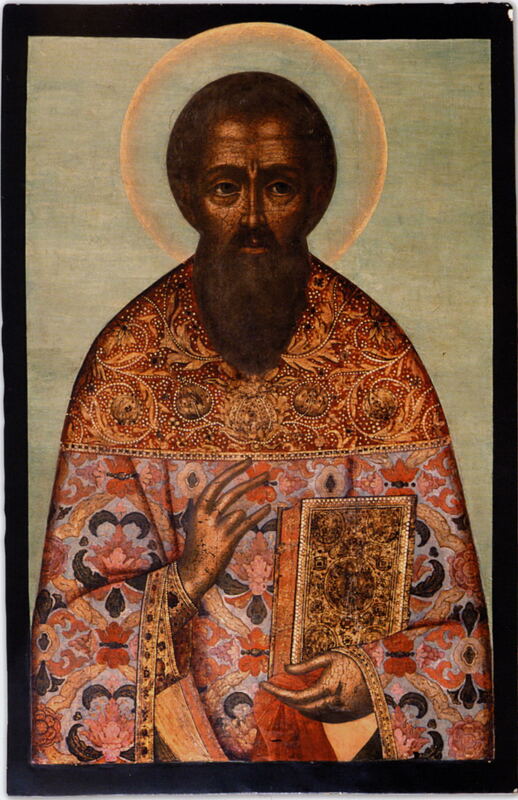 When the emperor Diocletian (284-305) began his fierce persecution against Christians, Saint Artemon was already old. The emperor issued an edict ordering Christians to offer sacrifice to idols. Afterwards, Saint Sisinius and Saint Artemon gathered the flock into the church and fervently exhorted the Christians to remain firm in their faith and not to fear the threats of torturers. Patricius thought that Artemon killed the snakes by sorcery, and again he interrogated and tortured him. Then the doe which had spoken arrived in Caesarea. The doe lay down at the feet of the martyr, licking his wounds. By God’s command the doe spoke again, denouncing the impious pagans. Addressing Patricius, the doe predicted that he would be seized by two birds of prey, and dropped into a cauldron of burning pitch. Patricius was enraged because he had been censured by a wild beast. He commanded his soldiers to shoot the doe with arrows, but she escaped. Afraid that the miracles performed by Saint Artemon would draw more people to him, Patricius gave orders to execute him. Many of the baptized were ordained to the diaconate and priesthood, and Vitalius was made Bishop of Palestine. The hieromartyr Artemon, instructed by the voice of God, preached the gospel in Asia Minor. Then an angel appeared to him and transported him to the place which had been revealed to him, where he converted many to Christ. There Pagans seized the Saint and beheaded him in 303. His primary feast day is March 24th. By sharing in the ways of the Apostles, you became a successor to their throne. Through the practice of virtue, you found the way to divine contemplation, O inspired one of God; by teaching the word of truth without error, you defended the faith, even to the shedding of your blood. Hieromartyr Artemon, entreat Christ God to save our souls. Made worthy of a sacred confession, and completing your life as a martyr, you were translated to heaven, receiving from God an unfading crown. Therefore we celebrate your holy memory, calling out: Remember us, as you stand before Christ, O wise Hieromartyr Artemon.